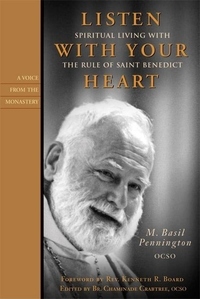 For today's hungry Christians, teachings on the Rule of Saint Benedict by one of the twentieth century's best-loved Catholic writers. At Our Lady of the Holy Spirit Monastery in Conyers, Georgia, Abbot Basil Pennington gave weekly talks to the monks on the Rule of Saint Benedict. Now, readers and listeners are able to sit and learn from one of the most important spiritual teachers of the last century. The talks have been lovingly transcribed and organized into book form, and they have also been exquisitely preserved on a single compact disk. This ancient Rule, written in the sixth century, continues to be a guide for men and women wishing to live a Christian life. Beginning with the prologue, Abbot Basil reads and comments on selected passages, providing the monks with insights into applying them in daily living. He takes the Latin phrases from the Rule and translates them into wisdom for the journey. Using his own monastic experiences, Basil illustrates how the Rule is more than a guide - it is a way of life to be lived in love for Jesus Christ and in service to others. The Listen With Your Heart Compact Disc (double CD) is the recorded version of M. Basil Pennington giving nine of the talks from which the book is transcribed.